 Small Musical Bow | Pandorapedia: The Official Guide to Pandora | Own AVATAR on Blu-ray & DVD Now! The small musical bow called hì’i pamtseo tsko, like its larger cousin the tsawl pamtseo tsko kllte, bears striking similarities in construction to the Terran berimbau of Brazil. The hì’i pamtseo tsko is simple, small and portable. It is created from the actual hunting bow of the Na’vi by temporarily holding a resonating gourd against the string. The string is then struck on either side of the gourd with the tail spike of a stingbat. A different, slightly metallic pitch is produced on either side of the gourd. This size of bow accompanies hunting chants and story songs about hunts. Almost all Na’vi have some experience with this instrument. Function Accompanies hunting chants and story songs about hunts. Size and Weight Various, but no more than two meters, 2.5 kilograms. Materials and Construction Small hunting bow made from wood, twine, leather. Small gourd is attached.